If you're one of those people who prefers lipsticks and tints over lip gloss - guess what? This Lancome Lip Lover lip gloss IS actually for you. This brand new lip color is the closest thing to a liquid lipstick as I've seen - and it's amazing. The texture is creamy but still very lightweight. On the lips it felt smooth and hydrating. But what I really loved was how much the pigment and texture once on the lips mimicked that of a mid weight lipstick with a shiny/satin finish. For a neutral lip, I went with Lancome Lip Lover 314 Casse Noisette (shown, above). It's a brown with just the right amount of neutral pink to make a everyday neutral lip with a bit of shine. Casse Noisette will work well over a slightly darker lipstick as more of a traditional lip gloss, or on it's own with a very good color payoff. This lip line does have a scent - it's a fruity, berry one that does dissipate fairly quickly and was pleasant. The staying power was good, but it definitely had to be reapplied after eating a meal or multiple drinks, etc. I did love that my lips did not dry out at all during the day while wearing it - so it eliminated the need to also use a balm, etc. I also love the packaging. It's only about 4 in long, and it fits perfectly in any bag, pocket or even jeans for a quick touch up. You unlock the gloss wand by pressing the small silver square in the front of the tube bullet (right above the Lancome engraved text) and then pull it up to release the wand. 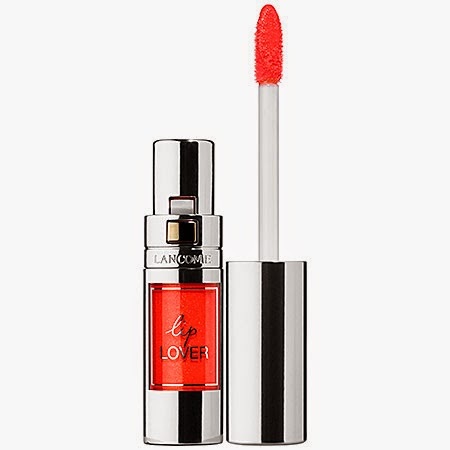 If you want to try the Orange lip trend for this season, look no further than Lancome Lip Lover 336 Orange Manege (shown to the left), which is a very flattering slightly pink, orange which really brightens up the skin and also had a very good color payoff.